Late in 1969 The Moody Blues released To Our Children’s Children’s Children, this is an album firmly rooted in the Prog Rock genre, and supposedly was themed after the recent Apollo moon landing. Once again The Moody Blues had a huge hit on their hands with the album reaching #2 in the UK and #14 in the US, and once again they had little luck with charting a single. In retrospect I see two reasons for the lack luster in the singles charts. Firstly, when you take the work as a whole it is wonderful, a thematic album that flows gently from one song to the next, but there is no one song that jumps out at you. Although maybe the second reason is the most problematic, the songs are complex, this is unquestionably a studio album, and many of the songs were difficult, if not impossible to perform live. Most bands have one predominate writer, that cannot be said of the Moody Blues, and this album in particular is testament to that. Every band member has writing credits. What is surprising, based on that, is how well the album flows, clearly this was a very unified group with a common goal. Justin Hayward is an outstanding musician, and one thing that I noticed was that although it was not to be released for another 9 years (1978) you can hear parts of the very darkly themed War Of The Worlds album that he collaborated with Jeff Wayne on. Once again it is the bonus material that UME has included with these re-releases that make this a must have set for any Moody Blues fan. There is a spectacular version of Gypsy. In fact it is so good that it should have been released as the single to accompany the album instead of their choice Watching And Waiting. The extended version of Sun Is Still Shining is also a wonderful adventure, incorporating a vaguely Middle Eastern rhythm this is a very more-ish track. It also would have made a great single, but maybe it would have been a little before its time. One of the most noticeable differences in To Our Children’s Children’s Children is the lack of the Mersey/Brit Pop sound that was prevalent in Days Of Future Past and made the occasional appearance in On The Threshold Of A Dream. This is a musically very satisfying work, and one that I am so pleased to see do a Phoenix and rise from the ashes, or at least rise from the music vaults! You can pick up your copy from record stores everywhere, or from Amazon. 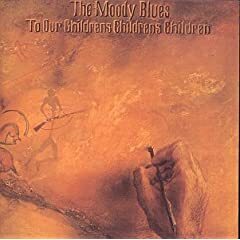 1 user commented in " CD Review: To Our Children’s Children’s Children by The Moody Blues "
I couldn’t have said it any better. Excellent review. You “get it”. Beautiful album. Wonderfully written, planned, arranged, it’s all so… just right.